The settlement of Platani, just 2 kilometers west of the city of Kos on the road to the Asclepeion, is a unique example of the co-existence of two vastly different religious groups. Greek Christians and Greek Muslims have lived here harmoniously side-by-side from the time of the Ottoman occupation of the island. The name of the village Platani is derived from the large plane tree (“platanos”) which dominates the central square, but was called “Kermentes” until 1964 by the village’s approximately 1,500, the sounds of whose characteristic religious chants fill the village center each Friday. The mosque, built in 1784 and the only surviving, functioning place of worship of its kind in the area, houses a painting depicting the entire Koran in verses handwritten in microscopic letters. 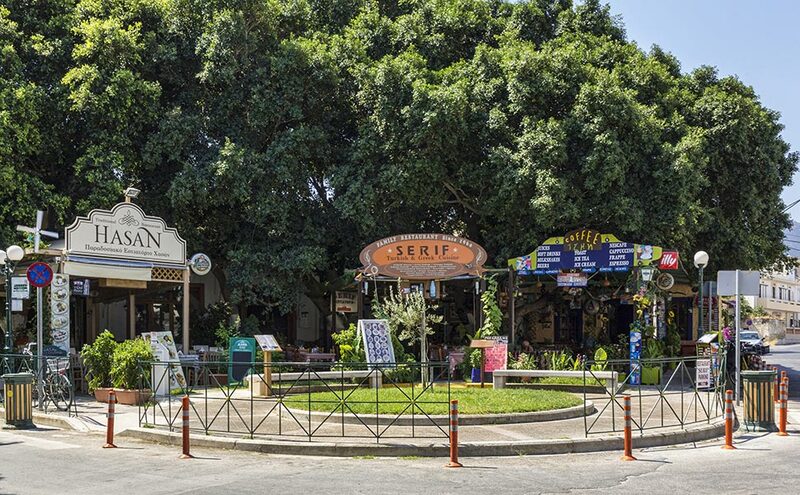 Here you can taste the delicacies of Asia Minor, while close to the village is the pine-clad Jewish cemetery.